Nitrous Express Master Flo-Check Pro UNIVERSAL - Pann Auto Performance - San Diego largest aftermarket automotive performance parts - What do you drive? The Master Flo-Check is an easy to use and a reliable way to establish the flowing fuel pressure of your NX Nitrous System. The Nitrous Express Master Flo-Check Pro gauge kits were designed for dialing in that exact fuel pressure for a perfect nitrous tune-up. The gauges display the fuel pressure for any nitrous system and are accurate to with +/- .01 percent. Each kit comes complete with a 6 in. 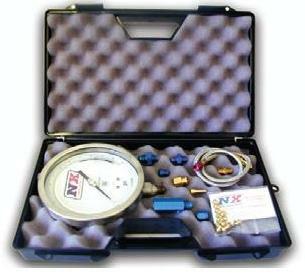 gauge, all jets and fittings, and plastic molded carrying case.